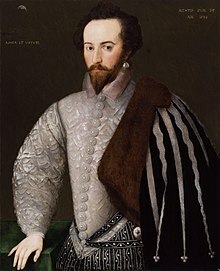 Sir Walter Raleigh ( /ˈrɔːli, ˈræli, ˈrɑːli/; c. 1552 (or 1554) – 29 October 1618), also spelled Ralegh,  was an English landed gentleman, writer, poet, soldier, politician, courtier, spy and explorer. He was cousin to Sir Richard Grenville and younger half-brother of Sir Humphrey Gilbert. He is also well known for popularising tobacco in England. Raleigh was one of the most notable figures of the Elizabethan era. In 1594, Raleigh heard of a "City of Gold" in South America and sailed to find it, publishing an exaggerated account of his experiences in a book that contributed to the legend of " El Dorado". After Queen Elizabeth died in 1603, Raleigh was again imprisoned in the Tower, this time for being involved in the Main Plot against King James I, who was not favourably disposed towards him. In 1616, he was released to lead a second expedition in search of El Dorado. During the expedition, men led by his top commander ransacked a Spanish outpost, in violation of both the terms of his pardon and the 1604 peace treaty with Spain. 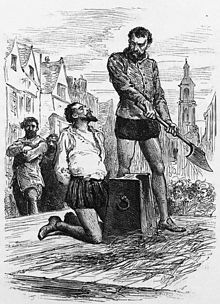 Raleigh returned to England and, to appease the Spanish, he was arrested and executed in 1618. Little is known about Raleigh's birth  but he is believed to have been born on 22 January 1552 (or possibly 1554, according to the Oxford Dictionary of National Biography ). He grew up in the house of Hayes Barton,  in the parish of East Budleigh in South Devon. 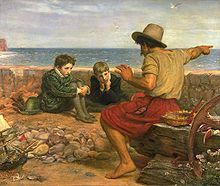 He was the youngest of the five sons of Walter Raleigh (1510–1581) (or Rawleigh) of Fardel Manor in the parish of Cornwood,  in South Devon. His family is generally assumed to have been a junior branch of the de Raleigh family, 11th century lords of the manor of Raleigh, Pilton  in North Devon, although the two branches are known to have borne entirely dissimilar coats of arms,  adopted at the start of the age of heraldry (c.1200-1215). His mother was Katherine Champernowne, his father's 3rd wife, the 4th daughter of Sir Philip Champernowne (1479-1545), lord of the manor of Modbury, Devon, by his wife Catherine Carew, a daughter of Sir Edmund Carew (d.1513) of Mohuns Ottery in the parish of Luppitt, Devon,  and widow of Otes Gilbert (1513-1546/7) of Greenway in the parish of Brixham and of Compton Castle in the parish of Marldon, both in Devon. Katherine Champernowne's paternal aunt was Kat Ashley, governess of Queen Elizabeth I, who introduced the young men at court. The coat of arms of Otes Gilbert and Katherine Champernowne survives in a stained glass window in Churston Ferrers Church, near Greenway. Sir Walter's half-brothers John Gilbert, Humphrey Gilbert, and Adrian Gilbert, and his full brother Carew Raleigh were also prominent during the reigns of Queen Elizabeth I and King James I. Between 1579 and 1583, Raleigh took part in the suppression of the Desmond Rebellions. He was present at the Siege of Smerwick, where he led the party that beheaded some 600 Spanish and Italian soldiers. Raleigh received 40,000 acres (16,000 ha) (approx. 0.2% of Ireland) upon the seizure and distribution of land following the attainders arising from the rebellion, including the coastal walled town of Youghal and, further up the Blackwater River, the village of Lismore. This made him one of the principal landowners in Munster, but he had limited success inducing English tenants to settle on his estates. Raleigh's management of his Irish estates ran into difficulties which contributed to a decline in his fortunes. In 1602, he sold the lands to Richard Boyle, 1st Earl of Cork, who subsequently prospered under kings James I and Charles I. Following Raleigh's death, members of his family approached Boyle for compensation on the ground that Raleigh had struck an improvident bargain. When the supply ship arrived in Roanoke, three years later than planned, the colonists had disappeared. :130–33 The only clue to their fate was the word "CROATOAN" and letters "CRO" carved into tree trunks. White had arranged with the settlers that if they should move, the name of their destination be carved into a tree or corner post. This suggested the possibilities that they had moved to Croatoan Island, but a hurricane prevented John White from investigating the island for survivors. :130–33 Other speculation includes their having starved, or been swept away or lost at sea during the stormy weather of 1588. No further attempts at contact were recorded for some years. Whatever the fate of the settlers, the settlement is now remembered as the "Lost Colony of Roanoke Island". In 1596, Raleigh took part in the Capture of Cadiz, where he was wounded. He also served as the rear admiral (a principal command) of the Islands Voyage to the Azores in 1597. On his return from the Azores, Raleigh helped England defend itself against the major threat of the 3rd Spanish Armada during the autumn of 1597. The Armada was dispersed in the Channel, and later was devastated by a storm off Ireland. Lord Howard of Effingham and Raleigh were able to organise a fleet that resulted in the capture of a Spanish ship in retreat carrying vital information regarding the Spanish plans. Raleigh wrote a poetic response to Christopher Marlowe's The Passionate Shepherd to His Love of 1592, entitled The Nymph's Reply to the Shepherd. Both were written in the style of traditional pastoral poetry and follow the structure of six four-line stanzas employing a rhyme scheme of AABB, with Raleigh's an almost line-for-line refutation of Marlowe's sentiments. Years later, the 20th-century poet William Carlos Williams would join the poetic "argument" with his Raleigh was Right.
" The Nymph's Reply to the Shepherd"